Welcome to the second tutorial for my newest book Handmade Christmas Cheer. This Tuesday we will talk about the show stopping quilt I named “Welcome Christmas.” What spells Christmas more than a wreath on the door. Better yet a wreath quilt!!! I am asked about this quilt so often! I have to tell you that it is surprisingly easy. The background of the quilt is one piece of fabric cut width of fabric x 60 1/2″. I ripped the selvages off (yes I said rip and I talk about that in the book), and left the length approximately 60 1/2″. You can, of course make the quilt longer and wider if you wish, just add additional background fabric to the left and right sides of the width of fabric piece and add length to all pieces for a larger quilt. I am currently doing just that, making a king size quilt for our bedroom. We will come back to this after learning how to make the wreaths and bows. There are different methods to hexie construction. English Paper Piecing is extremely popular and I describe this technique on page 10. My preferred method is to make a hexagon template with the 1/4″ seam allowance added (template provided in book template pull out section). I like to use a sandpaper board, a .05 pigma pen, and my 1/4″ angle tool.angle marking tool below. There are many types of this tool by different manufacturers so you should easily find it at your local quilt shop. If not here is a link to one on Amazon. Using a small ruler draw the seam allowances on the wrong side of the fabric. OR make a dot where the seams will intersect at 1/4″. Once the lines or dots are made we VERY SIMPLY sew the units together along the line or from dot to dot. There are no papers involved in the process and we are done in a hurry. When sewing take a tiny back stitch two or tree times and then make a running stitch and another tiny back stitch. This method makes sewing the intersection of 3 hexies a snap. The fabric is easily manipulated at the corners of the hexies (remember to do the tiny back stitch each time.) See page. 10 Handmade Christmas Cheer for step by step directions. Use the book as a suggested placement guide. I used a very small blanket stitch and invisible thread (.004 nylon monofliment by YLI in clear and smoke) to stitch the wreaths to the background of the quilt. There are three sizes of wreaths in this quilt. The large and medium have two rounds of hexies. The smallest has one. The diagrams are on page 9. Time to put a bow on it! There are three different sizes of bows and the templates for each are in the pull out templates at the back of the book. (love me some full size pull out templates!) I used a mixture of fabrics. I love the differences in texture and luster. I used wool, cotton, and silk. The wool does not have turned under edges (another time saver). The cotton and silk do have the edges turned under and blanket stitched with the same mono-filament thread. You may use any method of applique that is your preference. It is your quilt! My quilt was long arm quilted by Leisa Wiggley to perfection. I used a contrasting green for the binding. I hope you enjoyed this little tutorial and will bookmark it for future use. Next week we talk about the front cover stockings. “By the Chimney with Care”. What can I say? WELL! I have much to say about these beauties…and a surprise too. Leave me some comments. I love to hear from you. Here we are the first day of the first project in my new book Handmade Christmas Cheer. I know you have chosen this book and the projects within because you have an interest or dare I say, love of handwork. I do too, and that is why I am so proud of this book! Tuesday will be our day for talking about the book let’s begin with how I am choosing projects. We will talk about all the projects in the book but the ones that take the most time ( I didn’t say they were difficult did I?!?). I chose Long Winter’s Nap As our first project. If you are going to do a large sheet you have some wonderful hours of stitching ahead. Not difficult but wonderfully time consuming. I love Netflix and books on tape so do you see a pattern here? Give me that needle and thread and I am soooo happy. Chose the background fabric for your embroidery mine was White Bleached, Bella Solid by Moda # 9900 285. Moda makes a Bleached White and White Bleached note the difference. Measure and cut your background embroidery fabric 6½” x the width of the sheet + 2″. I like to use a backing for my embroidery pieces. Muslin works fine but I really like to use WOVEN fusible inner facing. My favorite brand is by Staple Sewing Aids. Pellon makes a good product as well. These products are very light weight and prevent shadowing or threads showing through from the back to the front. They also prevent distortion of the fabric. The bonus is tiny bit of body as well without affecting my ability to make small stitches. Cut the same length as the above embroidery background fabric. What do I use to write with as I transfer the designs? My preference is to use a .05 Micron Pen in brown. Remember this is permanent so be careful. My stitchery will cover the drawn lines, no problem. Other choices are a wash off blue marker by Clover, or the FriXion Pens which disappear with heat from your iron (or in my case, in Atlanta if left in the car during the Summer). Lots of choices out there, chances to experiment and find out what works for you. Let’s talk thread! I am asked ALL THE TIME what my preference for thread would be. I will say that in the world of embroidery I like floss over a cotton. As for brand of floss (a deep well) I honestly love Cosmo and Aurifil floss. However my choice of floss is determined by one factor, COLOR. I will choose Cosmo, Aurifil, DMC, Weeks etc. if the color is right then brand is a secondary consideration. Perhaps one exception is that I love the Cosmo Seasons floss for variegated work. The color changes more frequently with this floss. The pine boughs in this project are Cosmo # 8034. You can get the thread right here The Christmas lights are outlined and then accented with metallic thread. Two strands are used throughout the project. Size 24 Chenille needle. I like a chenille needle over an embroidery needle because the point is sharper. I cannot live without my Clover needle threader for embroidery. See picture collage above. Let’s sew. Stitch with or without a hoop, whichever is most effective for YOU. I write about this in my book on page 87. I use a Stem Stitch throughout the whole project. The diagrams for Stem Stitch are on page 91 of my book. Remember to keep your stitches small and even and your work will be beautiful. Keep the tail of the working thread consistently above the needle or below. Back Stitch is easier and a little more forgiving and is described on page 90. Again this is your choice there is no right or wrong. After you have stitched the pine boughs and words it is time to color tint and stitch the outlined bulbs and bubble bulbs and their sockets. Follow the book and notes on how to do this super easy and fast technique. I have included a pictorial of a bulb I drew for this blog. Save your coloring and outlining of the light bulbs until the end to avoid too much handling. Color tinting has been around for decades! Believe me the color does not wash out. My Grandmother had tea towels that were colored with embroidery and she washed them a zillion times. It really kicks your embroidery up a notch too! I outlined the bulbs and then stitched x’s with metallic floss 2 strands for a tiny bit of sparkle. After you have finished the project it is time to attach the embroidery header to the body of the sheet. Honestly the best descriptions, diagrams and tips are in the book (and this blog tutorial is already quite long). Read “Finish up” on page 19. It is really easy and works up quite quickly. After you are all done…..send me photos. PS. Don’t forget all the same practices work for the pillow cases in case you want a smaller project for gifting! You guessed it THE BOOK pgs. 22-25! See you next Tuesday for the Welcome Christmas stunning quilt. A big show stopper! When a friend asks you for a favor…say YES…everytime! 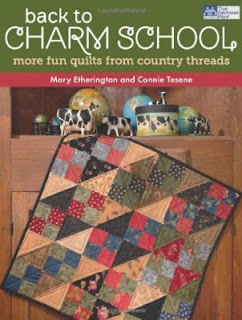 Today is my day to give a little review about Connie and Mary’s book “Back to Charm School”. I will stay on task and review the book but first a message from our sponsor ” me”. I could not review the book without talking a little about Connie and Mary. These two ladies have been in business for 29 years. This alone is an accomplishment of epic proportion. They are without doubt…QUILT INDUSTRY TRAILBLAZERS! A few years ago I had the pleasure of hosting them for dinner in my home along with a group of friends who co hosted. We had a grand partay and I have special memories of that night and the retreat that followed. Whatta treat. I will blog about that tomorrow (with photos) and tell you about the memorable time we spent with Connie and Mary. What I want to say here is that the honor of reviewing their book is something I’m grateful and happy to do for these two gentle spirited, kind hearted women. So now I get to talk about ” Back to Charm School”…my pleasure ladies! Let’s just talk about the title of the book and the theme ” Back to Charm School.” Each project has a GOLDEN RULE of manors and ettiquette to live by. I love it! Am I getting old (don’t answer that question) or are we forgetting our manors more frequently? I love each little pearl of wisdom and laughed at most of them! Use a Napkin only for your Mouth! hahahaha Never Wear Gloves at the Table. These are great. I would like to add one. Turn Your Cell Phone Off in a Restaurant.. ok I digress I’ll get off my soap box. I love the theme of the book sooo much. GENIUS LADIES. Do I have to pick a favorite project from this book..reeeely…I’m mean seriously??? Ok so if I could only choose just one I suppose it would be Do No Put Your Elbows on the Table. 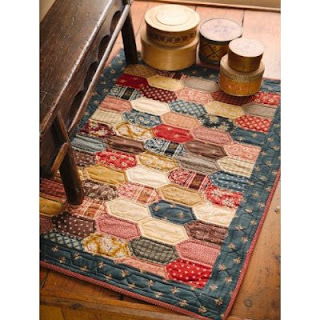 The Honeycomb I quilt. This is my kinda quilt. 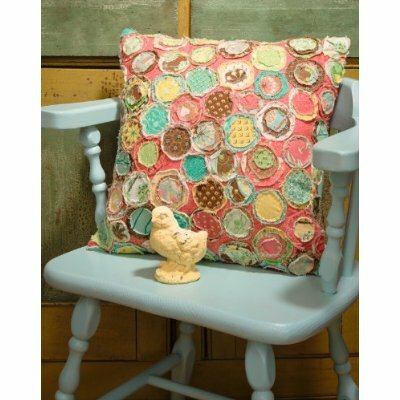 It is old fashion looking but you could jazz it up with some contemporary fabbies. You could also make a little mini signature quilt from it and have your sewing group sign the blocks or sumthin like that. I think I will try to make this little quilt and reconnect with my inner Y seam. Do some hand work in the car while traveling. What do you think? I haven’t made a project using templates in a long time. This would be a good place to return to hand piecing, which is how I learned to quilt back when dinosaurs roamed the earth! This book is perfect to pick up and make some small projects that are doable…They point out that you can do the machine quilting on your home machine (a prospect that terrifies me). This may be a super place to practice quilting on my machine instead of quilting with my credit card! I would be more inclined to do some hand quilting, again the projects are small and I can get er dun without too much stress! We have come to love the beautiful photography in all the books that come from Martingale & Co. this book is no exception. There is a warm cozy feel to the projects within the pages of ” Back To Charm School” which is no surprise because of the warm wonderful people who wrote the book and the company that styled it. It is kinda like putting on your comfy clothes and sitting by the fire and planning your next quilt project. Wrap yourself up in this book friends, and start sewing you won’t regret it! I have two books to give away. That means there will be two winners hahaha (I’m such a smarty pants). They are both signed by Connie and Mary. Just cuz I love ya I will throw in some pre cut 5″ charm squares cut from my very own stash…and a copy of the Goat Gazette. I will tell you, next post, about the Goat Gazette which is the newspaper that Connie and Mary have been sending out for years. They were into social media before it was KOOL. So leave me a comment and tell me where you are from and what quilt project you are working on right now. Go on now. I want to see a whole bunch of comments so tell your friends to stop by! PS. I will leave this give away open until 10pm Monday night. Then I have to go to bed I need all the beauty rest I can get.